We’re pleased to announce the first of a wealth of new sourcing tools – an integration with Intercom that allows you to advertise your vacancies and receive applicants right from inside your Intercom Messenger. We’re passionate about helping organisations build better teams. In order to do this, we’re constantly evolving Pinpoint with a view to supporting both sides of the recruitment ecosystem – sourcing and selection. We’re already addressing the selection side with a comprehensive suite of tools to help businesses filter, assess and hire candidates and this integration with Intercom is the first step of many on the sourcing front. We’re huge fans of Intercom and were thrilled to be able to work with them to implement this integration, offer Pinpoint to their 30,000+ customers and to sit in the Intercom App Store alongside software greats like Mailchimp, Stripe and Aircall, all of which we use here at Pinpoint. Integrating Pinpoint with your Intercom account is simple – you can be up and running in just a few minutes, just browse to the Intercom App Store, click on Pinpoint and click ‘Install’. 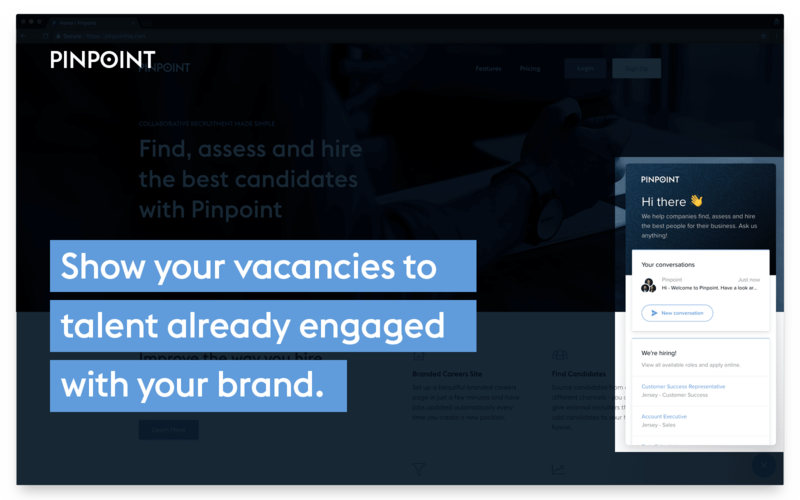 Once setup, Pinpoint will automatically advertise your vacancies to potential talent already engaged with your brand, allowing them to review job descriptions and even apply for roles without ever leaving the page they’re looking at on your website. Try it yourself by clicking the green speech bubble in the bottom right hand corner of the page to see our own live vacancies, or learn more about our Intercom integration here.